Lucky Star: an anime of pure weirdness and randomness. 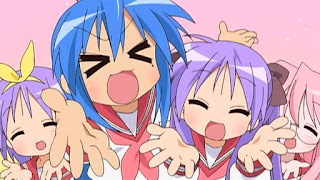 This follows the story of four second-year high school friends, Konata, Kagami, Tsukasa and Miyuki and their daily lives both in and out of school. That about sums it up for the main plot of this one, but there are other things to look forward to as well. As I said, it's an anime of pure weirdness and randomness, meaning anything could happen (only possible in reality of course, but then again this is a show). It's not your regular anime either as it has no core story line, apart from following the lives of the main characters through high school. If you haven't seen the show, you'll understand what I mean when you do watch it (if this review convinces you to watch it (hopefully!)). Because, for example, in episode 1 (incoming spoiler) there's a conversation about a chocolate cone/cornet which then changes to one about a cream puff (and changes again later on), but the way in which it is delivered makes it entertaining and interesting to watch. Again it is random, I'll agree with you there, but keep watching and these random moments do make for one entertaining show! Because of the pretty basic story line, there is no character development. This does allow for more focus on the main characters and more characters you will be meeting along the way, each with their own personality, adding humour and entertainment to the anime when brought together.